Create objects other than primitives – I added something around this in Part 3. Transform objects after they are created – I added something around this in Part 4 and Part 5. Have some ‘memory’ of messages that a client has missed such that not all clients have to joint a scene at the same time. I wanted to return and make some notes on that last point around a ‘memory’. Automatically parents it from a world-anchored object such that no hologram is more than 3m from its world anchor, dynamically creating and anchoring the parent if necessary. Exports the details of any newly created anchor to Azure blob storage. Multicasts a message around the network to let other devices respond and create their own replica of the hologram using the world anchor downloaded from Azure etc. Optionally attaches a ‘behaviour’ which will multicast changes to the local position, rotation, scale of the hologram around the network on some frequency so that changes made to those values will reflect across all the devices. Multicasts a message around the network to let other devices remove the object locally. and that all seems to work reasonably well. However, there’s a lack of ‘memory’ in the sense that if an app based on this code was to run on one device and take actions such as creating, transforming, deleting holograms prior to the app running on a second device then there’s no mechanism via which that second device can join the scene and catch up with what’s been happening on the first device. There’s no way to sync beyond having all the apps running at the same time which isn’t very realistic. I went with the 3rd option as it felt like a relatively small change to what I already had in my code. The device that receives the SceneRequestMessage multicasts back a sequence of SceneResponseObjectMessage messages, one for each shared hologram in the scene. 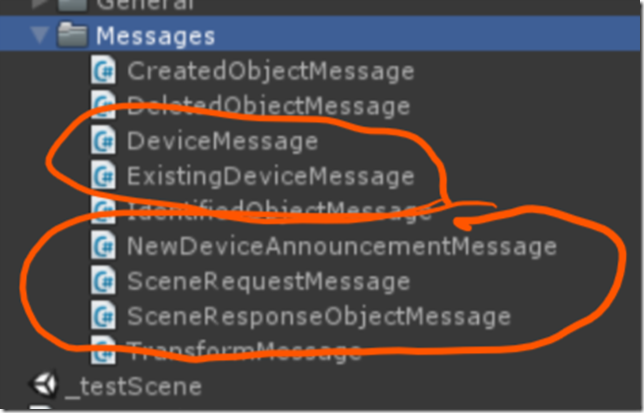 These messages also contain the intended recipient device ID so that other devices can ignore them. 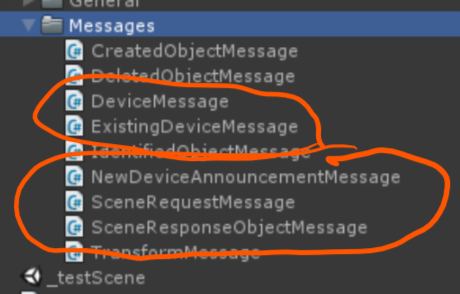 The SceneResponseObjectMessage is essentially the same as the initial CreatedObjectMessage which is multicast when the Create() API creates a shared hologram and so the handling of those messages doesn’t require lots of new code – it’s the same code that would handle the creation messages if the receiving app had been alive at the time that the holograms were created. The changes to send/receive/process these messages then become relatively minor and the code’s up to date on github. I also updated the console-based test application that I’ve been using to test out the code when only running with one HoloLens although I must admit that the code in that application is perhaps only really usable by me – it’d need some detailed explanation for someone else to pick it up and figure out what the heck I had in mind for using this test application but it has helped a lot along the way. I’m not planning to add more code into this series of posts. The only addition that I’d like to make (beyond testing properly on multiple devices ) is to add a better test scene.